They say that life's a beach - a saying that is certainly true on Lanzarote, where visitors can explore around 90 superb stretches of sand, some of which are ranked amongst the very best in Europe. So if you have rented one of our Lanzarote villas where will you find the best beaches on the island? 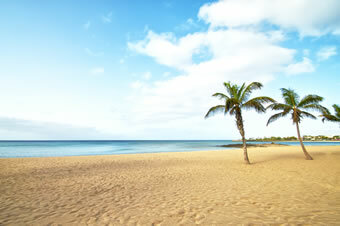 All of the three main resorts on Lanzarote boast excellent beaches - as you would expect. But what many visitors don't know is that most of these are entirely man-made, using sand imported from the Western Sahara (formerly owned by Spain) during the 1960's and 70's. That does not in any way detract from their overall beauty however. Costa Teguise is the third largest resort on Lanzarote and is located just to the north of the capital of Arrecife. In many ways it could be argued that this is the most attractive resort on the island - but the weather here isn't always as ideal as in Puerto del Carmen or Playa Blanca. Wind, in particular, can reduce the overall temperature and blow sand everywhere - which partly explains why Costa Teguise isn't as busy as its resort rivals to the south. That being said there are no less than five excellent beaches to enjoy here. The largest of these is called Playa Cucharas, which is about 1km long and shelves gently into the Atlantic. Tourists booking one of our Costa Teguise villas will find plenty of amenities here, such as WCs, showers, sun loungers and umbrellas. So it's a good choice for families with young kids, especially if they like splashing about in the sea. Thanks to the wind factor it's also a very popular spot for windsurfers too - but don't worry as they are carefully segregated from the bathers. Playa Bastian is the best beach in the resort when the wind does get up as it enjoys a more sheltered aspect than the rest and also has a number of large stone circles where you can soak up the sun out of the breeze. Playa Bastian is also located close to attractive gardens and has good facilities such as WCs and loungers. The only downside is that access to the water is made tricky thanks to all of the rocks, so it's not the best spot for bathing. The main beach in Puerto del Carmen is the aptly named Playa Grande, a very attractive 2km stretch of golden sand which is just perfect for swimming. Like most of the main resort beaches the amenities here are excellent and include WCs, showers and sun loungers. Playa Grande basically runs parallel with the main strip - the Avenida de las Playas - and as you follow this road in the direction of the airport you will also find lots of smaller bays and coves that are also well worth exploring. On the outskirts of the resort lies Playa Los Pocillos, a huge sweep of sand that often flatters to deceive a little, as it is quite exposed to the elements here and can often feel a little breezy. At the opposite end of the strip, past Playa Grande and Hotel Los Fariones lies the delightful little bay of Playa Chica, which is a hot favourite with locals. As anyone who has booked one of our villas in Playa Blanca will already know this resort is just made for beach holidays. There are three main beaches whilst just a short walk away are the all natural bays and coves of Papagayo. Playa Dorada is the main beach in Playa Blanca and is flanked by a couple of beach bars, making it possible to enjoy a light lunch or drink right by the sea. This is also a great choice for families as swimming here is very safe, whilst sun loungers and umbrellas are also available. Just a short walk away along the seafront promenade lies the small beach of Playa Blanca - White beach - which the resort is named after. And a futher stroll along the seafront promenade brings you to the very attractive beach of Playa Flamingo, which has now been fully restored after being battered by Tropical Storm Delta back in 2005. Playa Flamingo is encircled by large stone boulders, creating the perfect environment for safe swimming. There are also plenty of bars and restaurants close by. 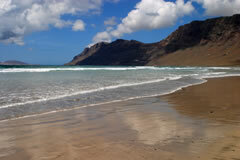 Some of the most attractive beaches on Lanzarote are located away from the main resorts. So book a Lanzarote hire car and get out and explore. Playa Famara is widely regarded as one of the most beautiful beaches on Lanzarote - and it's easy to see why. As it is flanked at one end by the 400 metre high Famara massif, whilst just out to sea lies the island of La Graciosa, which together create a very dramatic backdrop for this enormous 7km long beach. Playa La Garita at Arrieta is also a firm favourite with locals - and some of our best rural Lanzarote villas can be found close to the sands here too. There are two restaurants located right on the beach too so this is a great spot for lunch. Driving from Arrieta in the direction of Orzola brings you to the amazing bright white sand beaches that are collectively called the Caletones Blanco. The sand makes a striking contrast with the black volcanic rock and blue water of the Atlantic - and there are five different beaches to explore here.